Saturday morning in the studio, we will use small viewfinders and cameras to discover palettes of colors we like, then make sketches of tiny invented possibility paintings. Saturday afternoon we'll make an excursion to the rich Art & Architecture book collection at Norlin Library on the CU campus. In books myriad art forms are the inspiration for discovering new palettes. 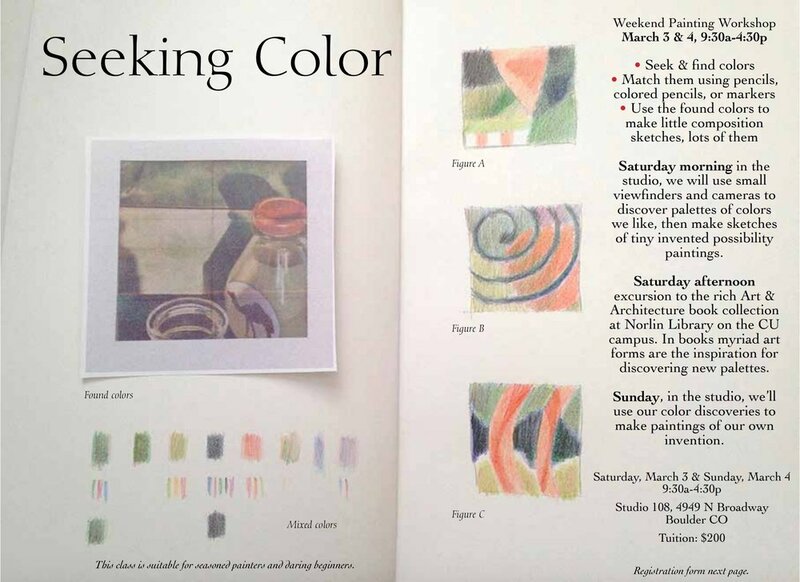 Then, back in the studio on Sunday, we’ll use our color discoveries to make paintings of our own invention. Workshop hours are 9:30am - 4:30pm both Saturday & Sunday at Studio 108 in North Boulder (with a field trip to Norlin Library on Saturday afternoon).